As always, Buster is the supervisor. After almost two straight days of rain, I woke up this morning to sun! The back yard is starting to dry out. I went to Home Depot on the way home from church this morning - Scott has been sick with the flu the past two days, so it was a solo trip. I got two bags of "garden soil" - still experimenting with what combination is going to be best for our clay base. I also picked up a Hosta and four part shade creepers to make a nice pot for right outside the back door. I added some part-sun creepers in between the phlox and then interspersed the baby wildflower peat pods as they are all about 2"-3" high. On the veggie side, I picked up some three-foot cedar log short fencing to back the lowest part of the garden, I figure we'll do another step above and back that also. I think it really tightens up the look of the whole thing. 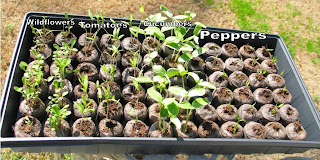 Once it was evident that I had enough soil to extend the low section, I dug up a few more feet and planted the baby bell-pepper peat pods and the baby cayenne peat pods. Scott took advantage of Buster holding still to get some great shots of his handsome face. On Tuesday I had the day off. After sleeping in I made some coffee and then headed out to Home Depot for gardening stuff and to Publix for groceries. At Home Depot I picked up a push broom (our back porch has gathered a lot of leaves and Scott thinks he saw a Black Widow near the back door), a small rake (to get the sticks out of the way of the garden), and a few plants and some soil. I staged where I wanted the herbs to go, since they and a pepper plant I purchased are the only things big enough to go into the ground. I raked the dead branches and some leaves out of the way and then Scott started digging up the clay. Buster was very interested in the whole process and we're now teaching him what he can and can't investigate (i.e. PEE on). We had about a half bag of potting soil left, so we threw that in the hole and then spread a bag of Mushroom compost on top. It looks a bit morbid from this angle, but I swear, we're not trying to get rid of a body! We decided to only dig up what we had soil and compost for and we'll dig additionally once the tomato and pepper plants are big enough to go in the ground and we have more soil and compost. I chose to put the rosemary in on the corner by the stairs, since it has the potential to be a large, pretty bush. Since we moved the peat pot tray outside and everything but the cucumber plants have been doing great. I don't know if it was too much sun for the cucumbers or if they just outgrew their pods, so I moved them into a couple of big pots in front of the "garden" area. I'm mostly excited about the basil plant because I LOVE pesto and it's awfully easy and cheap to make when you're growing the main ingredient yourself! We also planted our mint, oregano and a yellow bell pepper plant. On the "wildflower" side of the ledge I planted four creeping phlox plants. I'm hoping they'll spread nicely across the front and I'm going to plant the baby wildflowers once they're strong enough to go in the ground. Of course, we've been having a thunderstorm for the last eight hours and there is about two inches of standing water in the lower part of the back yard at the moment, so all the new plantings could be drowned by now. By my count, these little babies are about 12 days old. We moved them outside to get some sun and keep the cats out of them. This is where I plan to put the wildflowers. This is where I plan to put the cukes and peppers. I'm thinking about putting the tomatoes in pots just in front of the ledge. With the boss on vacation the last four days, I worked the last seven straight. A week ago last Saturday I planted the seeds I gave Scott for Valentine's Day in little peat pots. This is them at Three Days. Now they are outside in the sun and the Cucumbers (both varieties) are almost four inches tall. As soon as we have a good sunny day (maybe today?) I'll start digging our garden plot so I can at least get the cukes planted. I went to the doctor this last Monday, mostly because I needed to find a doc here in GA for prescription refills and such, but we're also going to start trying to find out if there's anything amiss in our efforts to get pregnant. Along with that, I wanted to switch anti-anxiety meds NOW instead of after becoming pregnant, because who needs raging hormones AND withdrawal?! As it turns out, Lexapro is actually safe to take while pregnant. I am currently on 20mg and will try to go down to 10mg, but not having to switch at all is a big relief. Life has been hectic lately... It seems like the last few weeks my brain has only been capable of work, food and sleep. Fortunately I love my job and I actually perform better with a bit of pressure, so things are going great in that aspect. The house is a little chaotic, we have a guest at the moment and I feel really bad when I keep coming home and she has cleaned my kitchen! I'm off today though, and plan to get a head start on her so she can just relax. In the food arena I'm trying to eat on a regular basis, which has been hard with everything that's been going on, but I'm down to about 125lbs without trying and if I am going to get pregnant I'll need to be better about nourishing myself.